In Toronto based dronescapers dreamSTATE celebrate annually the National Drone Day, which was established by Marie Claire LeBlanc Flanagan of Wyrd Arts Initiatives in 2014 and since then the communities across the globe connect during this international day to rejoice the drone music. "DRoNE DAY" recording documents dreamSTATE's live performance at Array Space in Toronto on the first National Drone Day on May 10th, 2014. The CDr edition, self-released by dreamSTATE during May 2017 through their e-SPACE Editions, comes in a standard jewel case with 2-panel front insert. Divided in two half hour parts, "DRoNE DAY AM" and "DRoNE DAY PM", each containing 5 tracks, the journey reveals with 7 and a half minutes long "AM-1". An intensely droning and spiraling sculpture keeps on emerging, expanding, vertexing, surging... Helixing cybernetic voice fragments are guarding above. A powerfully transcendental opening indeed! "AM-2", at 9:21 the longest track on this album, steps down to slightly quieter domains, where warmer, yet panoptic reflections collide with ear-tickling and buzzing high-tech enhancements. "AM-3" sustains carving circles of calmer ethereal glimmers as well as tenebrously dissonant vistas. Shorter "AM-4" juxtaposes both harsher and milder meridians with languishly galloping patterns, while another brief piece, "AM-5", follows the path of sinuously nuanced sceneries with piquant twists thrown in. Second part "DRoNE DAY PM" is ignited by "PM-1", a quietly evolving driftscape reinforced here and there by inconspicuously intensified climaxes. "PM-2" enters clandestinely the droning spectacle, where persistently soaring layers continuously enlarge into grandiosely panoramic stratums, while towards the end cyber-biotic gleams retain on arising, permeating and glancing. The Drone tour de force, bravo!!! Over 9-minute long "PM-3" moves into more relieving terrains, propelled by flickering downtempos during the starting two minutes. Afterwards metamorphosing into tranquilly evocative zones before resurrecting traverses of sparkling sequenced motifs. Cadences dominate "PM-4" with infinitely galvanizing IDM-fragranced arrangements, while halcyon blankets invade towards the end and carry the closing "PM-5" through spaciously immersing solitudes animated by raucously swirling trimmings. Scott M2 and Jamie Todd, the two Canadian drone connoisseurs behind dreamSTATE (and the members of The Ambient Ping gang), exhibit through 60-minute "DRoNE DAY" their creative forces in sculpting multidimensional drone enveavors. 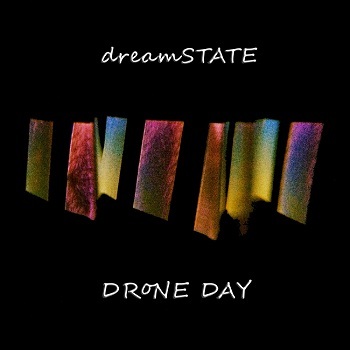 As usual, these true purveyors fully succeed in their mission, "DRoNE DAY" is another must-have release by dreamSTATE!!! In case you are not aware of their insignias, I strongly recommend explore their complete discography featuring 6 solo albums and two collaborations with their kindred spirit Heiki Sillaste (member of famous Digital Poodle and the driving force behind Paper+Sound label). This list also includes their latest release "EPHEMERAL DRoNE", from May 2018, focusing on their live performance on the third National Drone Day on May 28th, 2016. It's a second part of the planned "DRoNE DAY" trilogy. Before I forget, for all cassette aficionados out there, "DRoNE DAY" is available also in this format along with "EPHEMERAL DRoNE" and "Stone Shore" (with Heiki, released April 2017). Thank you Richard for your detailed review! Here's a short video of us playing some of the opening piece.